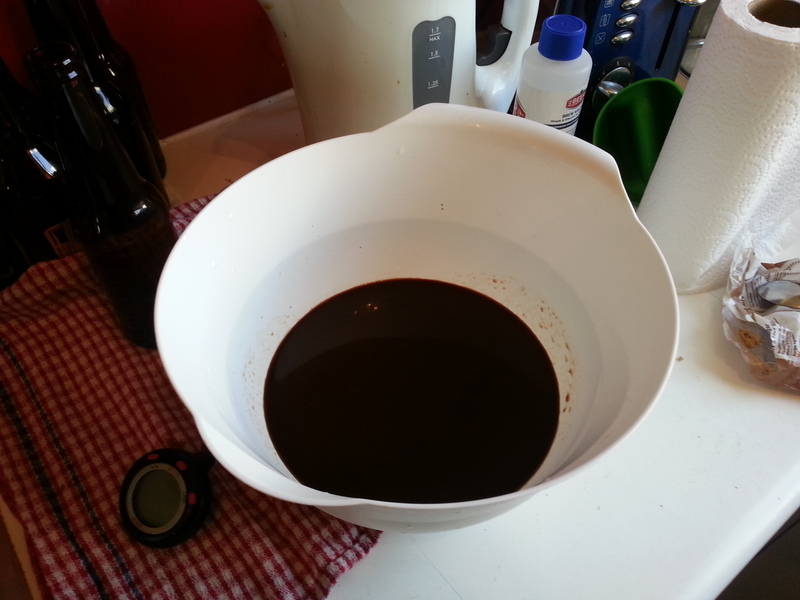 Back in June, Mikey and I made a coffee porter that I named The Friedlieb. It turned out great, but I was after a little bit more peat smoke in there, and Mikey found some of the sweetness “distracting”. So we modified the recipe a little bit. First off, we were doing twelve litres this time around, not the four we originally did; mostly we just multiplied everything by three. We also added a bit more peated barley, a bit less light liquid malt extract, and, as there were some malted grains in the grain bill, decided to mash the grains rather than just steep them. Hopefully this achieves the desired affects. Anyway, before I go into the recipe, as mentioned, this is a coffee porter. When we made the first batch, we were only using eight shots of coffee, which isn’t too difficult or expensive. Upping things up to twenty four shots of coffee wouldn’t have been too expensive or difficult, but there’s always a better way! So, a big thanks to my good friend from Husband Cafe for supplying his wastage. As mentioned, we decided to mash the grains. The right mashing temperature can change depending on what you’re after and what grains are being used, but we were winging it a bit and just decided to mash at 65 degrees C; it’s nice and middle of the road. The mash time was 60 minutes in 5 litres of water. Unlike the all grain pale ale we did a couple weeks ago, we didn’t have as much trouble keeping the water temperature steady. This was probably because we were using much more water. So the grains sat there for an hour while Mikey and I bottle the pale ale. It tasted great by the way, but we think it will need quite a bit of time in the bottle to calm down. With the mashing done, we threw in the malt extracts and got everything to a boil. Once the boil started everything was pretty standard. The bittering hops went in at the start, fifteen minutes in came the taste hops, and the aroma went in at flame out another fifteen minutes later. Along with the aroma hops we threw in the espresso and the brown sugar. A little tip on ingredients: always double check that you have the ingredients. I assumed I had enough brown sugar but I didn’t! Thankfully I was able to steal some from my housemate. Also, let’s see if my housemate actually reads this blog, because she doesn’t know I took it! Getting the wort cold was difficult. 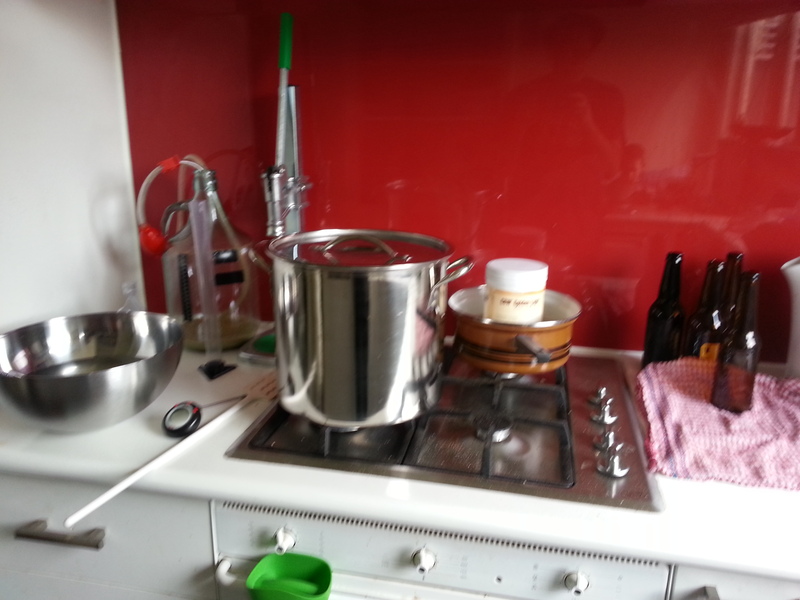 We ended up with about seven litres of liquid: five litre mash, a couple litres for sparging, coffee, etc. We got it coldish pretty quickly with some ice and cold water, but even in three ten minute water baths it wouldn’t drop below 30 degrees. I need to start taking a cue from Mikey and preparing lots of ice and cold water. Anyway, we poured everything into the fermenter, topped it up to 12 litres, and took a quick break on the homebrew couch while we let things cool a little. The wort was about 27 degrees by the time we topped up the fermenter, but we wanted a few degrees lower. 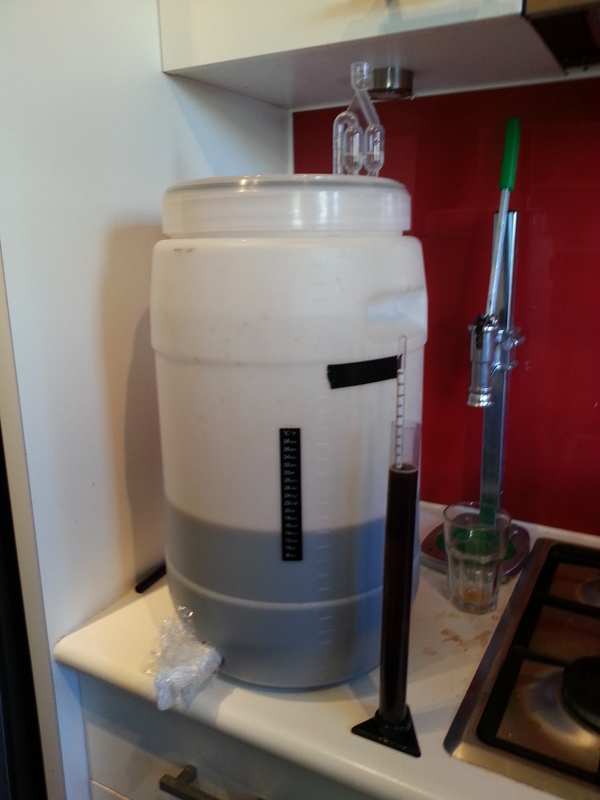 After that, we pitched the yeast and gave it a good stir to aerate it. The gravity reading was 1.073, which is quite high, so we wanted to get plenty of oxygen in there. I’m quite excited about this high gravity. The mash obviously added quite a bit. If we’re lucky and get the final gravity down enough, hopefully we’ll end up with quite a strong beer! I’m really excited about this beer. It’s going to be about two weeks in the fermenter, and then quite a bit of time in the bottle. We’ll report in after that.